Sliding left extension sub-table is provided. 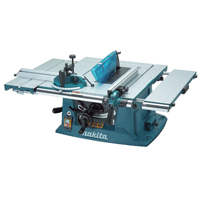 - Right and rear extension table enables greater cutting capacity. - Safety guard is installable and removable without tool. - On-tool storage for accessories is provided. - Dimensions (L x W x H) 726 x 984 x333mm (28-1/2" x 38-3/4"